The skin on our lips is much sensitive than the skin on our body. So, they need some special care in winter. Of them, exfoliation and hydration are the two important things. To exfoliate your lips, you need a lip scrub. So, Instead of investing huge amount on buying a lip scrub, prepare a homemade lip scrub and use it regularly. DIY Lip Scrub recipes are very simple to prepare and use. Follow the simple directions and prepare the best scrub that suits your skin type. Do not over rub when you are using sugar scrub as it may cause bleeding. Here are the four best DIY lip scrubs, so know the best one and use it regularly. Honey is the best moisturizer that you can give to your body. Honey helps in rejuvenation of the skin and nourishes it. When compare to skin on our body, the skin on our lips are much sensitive, and it needs special attention to avoid chapping of lips. Our lips get chapped in winters due to lack of moisturizer. So, to get back you smoother lips, use this Honey Sugar Lip Scrub. Sugar helps in exfoliating the dead and dried skin on your lips. Prepare a homemade lip scrub using honey and sugar to get smoother lips. 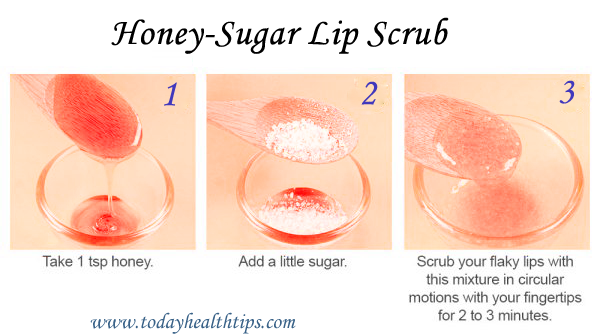 You can also use Sugar lip scrub alone instead of adding honey, but if you use honey, you will get moisturizer too. Take a clean and dry glass bowl and add a tablespoon of honey to it. Then take crystal sugar of about three tablespoons and add it to the bowl containing honey. Mix them well and pour it into a small container containing a cap. Take a coin sized amount of this Honey sugar scrub and gently rub it on your lips. After 5 minutes, wash with lukewarm water and moisturize your lips with Vaseline. If you are the victim of dark lips, then you should use this excellent DIY lip scrub. Lemon is an excellent bleaching agent and can remove the blemishes very effectively. So, use the lemon and sugar lip scrub regularly to get smooth and rosy lips. You can use brown sugar than crystal sugar as it is little softer. If you have sensitive lips, then use caster sugar which is smooth in its texture. Add a spoonful of olive oil to moisturize your lips. Homemade lip scrub made of lemon is harmless unlike artificial scrubs and of course it saves your pocket too. 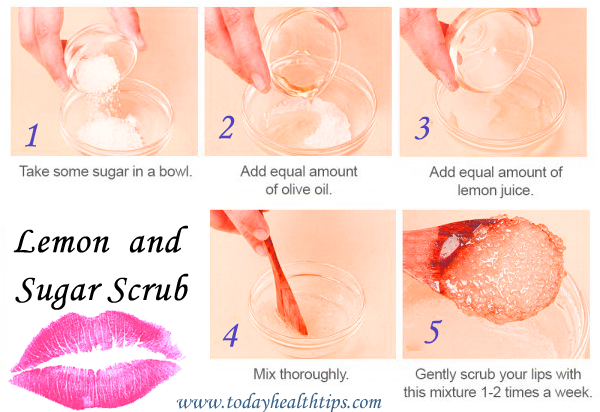 So, Know the Lemon and Suger lip scrub DIY method and use this regularly. Add three tablespoons full of sugar and three tablespoons of lemon juice. Mix them together to make them into a scrub like consistency. Add few drops of olive oil and mix them well. Gently rub the mixture on your lips for 2 minutes and wash with warm water. Do this regularly to get silky soft lips at home. It’s every girl’s wish to have dreamy, bright pink lips naturally. It is not a big deal to get pink lips but maintaining them is a bit difficult task. So, to keep your pink lips in good condition use the Rose petals DIY lip mask. But, How to make a lip scrub with Roses? But, How to make a lip scrub with Roses? Roses are very soft and gentle. They can’t exfoliate the skin but can nurture your lips and add its beautiful silky softness to you. 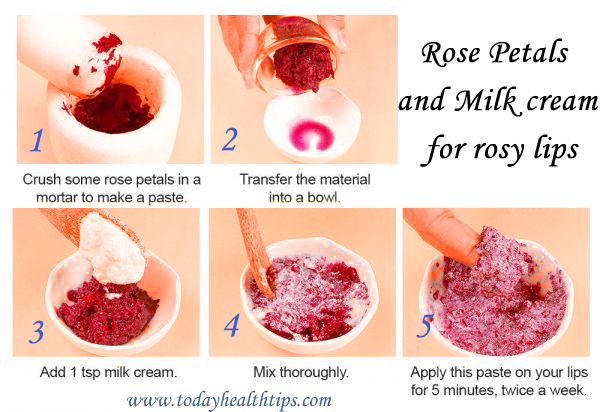 So, Know how to make lip scrub using roses for the treatment of chapped lips. It is the best Homemade lip scrub which can treat all your lip problems at once. Collect fresh rose petals from 10-12 flowers and wash them with water. Grind them to a fine paste without adding water to it and store it in a container. Add milk cream to this whenever you are ready to use this. Because if you add this milk cream before storing this scrub will not have a good shelf life. So, add this milk cream and apply to your lips. Then, take your toothbrush and gently rub it on your lips for 2-4 minutes and wash your lips, with warm water. You can also mix milk instead of milk cream to prepare this Lip scrub recipe. To treat chapped lips, there are two ways. One is frequently moisturizing them, and the other way is removing the dead layer by scrubbing. But, here are the nutrient-rich almonds which can perform both the tasks at a time which is more beneficial. So, prepare a DIY scrub using almonds to treat the chapped lips. 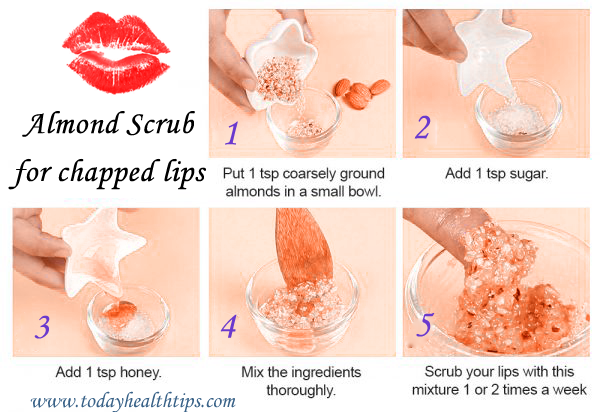 Use this Almond scrub for lips to avoid the chopping earlier. Take a bowl and add two tablespoons of coarsely grounded almond powder. To this, add two tables spoons full of sugar and a tablespoon full of honey. Mix all the ingredients well and apply this scrub on your lips. Leave it as such for 5-10 minutes and then take a toothbrush to rub on your lips gently. After the gentle massage washes the DIY lip scrub or Almond homemade lip scrub with lukewarm water. After cleaning the scrub away, apply Vaseline to your lips and leave it overnight for best results. Repeat this daily before you go to bed to get super soft lips within two days. So, these are the best homemade lip scrubs you can use regularly. These DIY lip scrubs are gentle and free from any harsh chemicals. So, they do not cause any harm to your lips. If you notice that you are irritant to any of the above mentioned ingredients, then stop continuing it. These lip scrub recipes are easy to prepare and store. So, use them daily to own Smoother lips.